I’ll start with the ugly. This one gives my collection manager’s heart the flutters, and not in the good way. Even if the user could identify those volumes (with their call numbers pointing up, above eye level), how are they going to get them off the shelf?! Now the bad. This isn’t good, but it doesn’t make me cry like those other shelves do. Sad books, unable to stand up, bindings getting damaged. Here’s the good, just a few shelves off. See how much nicer that is? 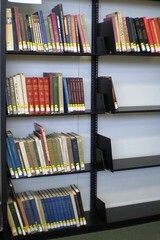 All the books upright, standing tall, spines and call numbers readable, easily accessible? We talked about this project for a long time. Our stacks managers wanted to do it for purely workload/workflow reasons — it’s terrifyingly hard to shift a collection when the books don’t actually fit on the shelves, and the shelves are sized differently from stack to stack, range to range. No matter how much we sympathized with their plight, though, we’d never had an oversize collection at MPOW before, and creating a new fragmentary collection was a struggle for us, philosophically. We have a strong tradition — backed up by student feedback — of facilitating browsing throughout the collection, and we’ve resisted fragmenting the collection in order to preserve browseability. We debated ’round and ’round. Do our concerns about appropriate management of the collection trump our thoughts on user needs? Are users better served by one continuous call number run? Are they better served by materials that are more easily accessed because they’re housed appropriately? What’s the best thing to do in our library, with our users, our collections, our physical spaces? In the end our communal opinions on how to balance the needs of the user with the needs of the collection led to the oversize collection. And I know that I feel confident about it, and am excited to see it finished. Now, what to do about these? And then suddenly you have human sacrifice, dogs and cats living together… mass hysteria. (ahem). As for the books: Nice solution. If you can find some REALLY GOOD bookends that stay in place to hold these monsters up, will you let me know? We have very tall ones but they can’t handle it when a couple of books are removed from the oversize shelf, and they end up like the Bad picture. Always. Not really much of an improvement. Our oversize seem to be a bit more oversized than anything in this photo though (think 37 cm. and up). In the gadget world, scaling up is perilous. Paper airplanes fly fine, but don’t try one big enough to ride! 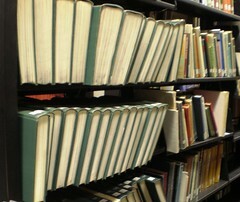 Folios are scaled up books. 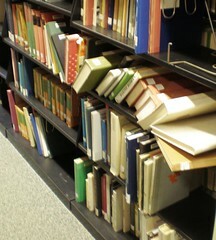 It’s obvious that taller, deeper shelves are needed for folios. Overlooked is that the extra concentration of weight means that the shelves should be less wide than normal book shelves. Even bigger bookends won’t hold that many folios. I think everyone can relate… my team recently adjusted the shelf heights for 15,000 books worth of stacks so that we could create a folio run. That was two weeks of dusty back-breaking work! But oh-so-satisfying. Best thing instead of oversized bookends is slotted shelving, where vertical dividers can be put in for provide additional support.